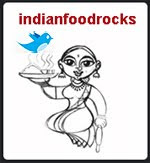 Indian Food Rocks: Stay a While, Won't You? All of the pics are good...but I like the second one best. I loved the 2nd pic, loved the beauty of capturing steam, plus the angle of this shot looks good to me! SO my vote is for # 2! I like the third one best, because it captures the intersection of "person and pot." Glad to see you back! I'm anxiously awaiting your next recipe. Yeah, every gappa-goshti needs some chai :). Lovely shots, i am dividedd between 2 and 3, quite smoking hot shots, them both :). Good to see you back. and there is some fresh Sichuan pepper/teppal that wants to travel to CO :). Oh, I like No. 2 the best. So evocative! What, no takers for #1? To that goes mt vote then! 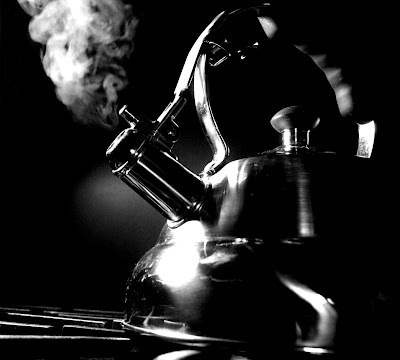 I do like it really; the perfect hiss of the kettle - can almost hear it. Very inviting; here's my cup for filling. all of them are so beautiful,as if I am watching an old hindi movie LOL... and always Old is Gold ..
3 rd one looks so good ..
All 3 are great, but the 2nd. wins hands down! Glad to see you Manisha! I wish u wud blog regularly from now on! Fabulous pics!! I vote for the second one, love the steam there.. The pahili waaf seems impatient to escape. Lovely idea and my preference would be for the second picture. 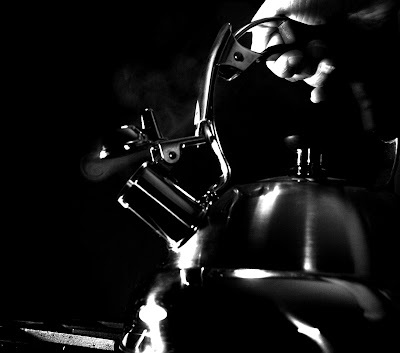 The contrast in the picture is better and if you could lighten the picture slightly the kettle would show up well with light and shadow details. Does this mean you're back?!! i hope so :) And I hope you tell us more about your Zoomba adventure, lol. They're all stunning, but something about the second one! 'nita...ya get used toit with'er..
Wow! I knew #2 would be popular but I did not think #3 would pick up more votes than #1! Jayashree and Purnima, thank you! I like the angle, too! John, I think we have similar tastes! I have a really simple yet delicious recipe lined up. In a couple of days, definitely! Bee, I thought you would say that, too. Santhi, glad to see you after a long time! I hope you poured yourself a cup! Musy, so when are you coming to do lots of gappa-goshti with me? Why not bring the tirphal with you? Kitt, I hope to be back with a post soon! I must find my fly swatter soon. I need it here and sometimes on Flickr, too. Jaya, I am glad you liked the mood set by the black & white pictures. Thank you! A Cook @ Heart, Uma, Namratha, and Mansi, thanks a lot! You are much appreciated! Siri, I'll take train, hissing, smoke...but why Shahrukh Khan?! Nooooo!!! TC, Anita loves you now! Aparna, thank you! And, I get what you are saying but making the photos brighter or lighter would nullify the technique used in these pictures. The idea is to use bold contrasts and shadows to create a mood. I hope to have a post on my Inner Lens blog about these pictures soon. I'm hoping it will become clear then! Pel, you're sure? You don't think you may have missed some permutation-combination of getting to the one in the middle? And swatter for you, too! I don't think the fly swatter would be much help - you'll just get tired and frustrated. You have an infestation, my friend. Dang! Just my luck! I can't win, Anita! UR TSUNAMI IN MARTINI WAS REALLY BEAUTIFUL,AND SO WAS THE CRACKED EGG! 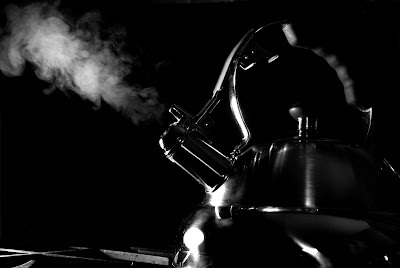 #2` HAS SLIGHT GLARE ON THE KETTLE! its me shabari here:) not sure if u rememeber me...had posted a line aaaagggges ago! i do pop in once in a while ,luv to read ur posts .... wakay manisha ,i here ya! will stop rambling and will get to the point:).....luv the 2nd pic! even thou i really like what the third pic represents!!!!! more wonderful posts to read! yeppieee! I like the 2nd pic..
Love the contrasts best in #2. Welcome back! This is a tough one but I'd send the second one. I find that it has more character and intrigue. Quickie, thanks! And I am thrilled that the mood appealed to you! ThreeTastes, thank you for not giving up on me totally! You have no idea how much I appreciate it. Cynthia, yes! Character! Thank you! Linda, looks like #2 is the all-time favorite! Thanks! Elsa, thank you so much! Your English is much better than my French! Archana, but your opinion counts regardless! Thank you!